First we should add a new landcover data source to be used for generation. If necessary landcover data source is already added, you may skip to step 3. Open the Landscape Tool window, for this purpose on the Menu bar, click Windows -> Landscape. In the Sources panel, add necessary landcover data sources (see Specifying Data Sources section). R8/16/32f and RGBA8/16/32f mask textures are supported. Select each landcover data source from the ones you added in the Sources panel and specify parameters in the Parameters panel. 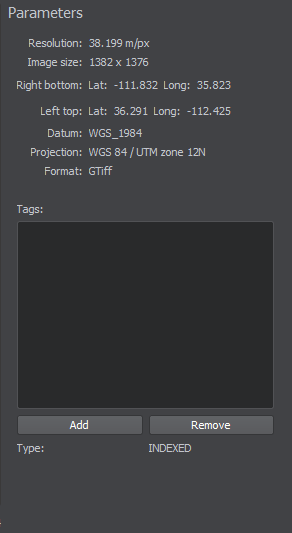 Depending on the type of the source data (the geo-referenced or the source tileset one), the set of parameters differs. The parameters of the source with no geodata are the same as for the elevation data sources (except Tileset Elevation Settings). Very often landcover data sources have insufficient density, which results in squared borders of grass-covered areas, etc. You can use data from vector sources to generate landcover objects and detail masks. Just rasterize a vector source to a landcover with any density you need and use it as usually. This feature is available via the Create landcover mask button in the Parameters window, when a desired vector data source is selected. In the window that opens you can specify vector tags to filter data for each target channel (up to 4 channels are supported). Add tags for each type of detail mask you are going to generate by clicking Add button at the bottom of the Parameters panel and specifying a tag name. To remove a tag use Remove button. You can't add tags named "height" and "mask" as these names are reserved for procedural refinement. For an R8/16/32f texture data source - by setting the range of bits (from value, to value) to be treated as a certain detail mask. For an RGBA8/16/32f texture data source - by selecting a base color and setting threshold value for a color gradient to be treated as a certain detail mask. Use "+" (plus) button to add a filter, or "-" (minus) to remove one. 1-channel R8 texture. 3-channel RGBA8 texture. Now all necessary tags and filters are added and you can proceed to the next step. Now, we must determine which tags are to be used to generate detail masks. 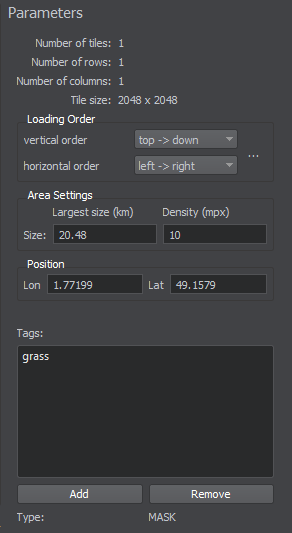 On the Sources panel, select the Masks (Landcover) data source type and the list of tags determined for all landcover data sources will be displayed in the Details Masks tab of the Parameters panel. Check the tags you added at the previous step to be used for generation of detail masks. If the tag isn't checked, the corresponding detail mask won't be generated. Now all necessary detail masks are specified and bound to tags. If the terrain is already generated and you want to add only detail masks - proceed to Step 3. Otherwise - return back to setting other parameters of terrain generation. Now you can generate detail masks by clicking Generate button and selecting Terrain -> Details option in the Steps window, in this case only detail masks will be generated. If you need to regenerate some of the existing detail masks, you should check all of the tags, including unchanged. 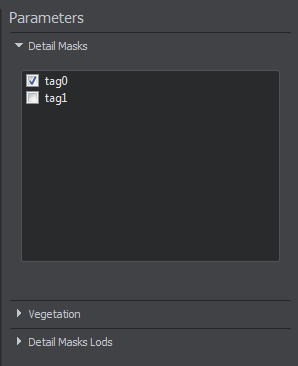 If the tag isn't checked, the corresponding detail mask will be deleted after terrain regeneration.